This cosy roof terrace is located atop a revamped Wapping wharf, where its 50-square-metre breadth envelops a modern apartment in an L-shaped outline to reveal an intimately secluded outdoor space. Viewed through a substantial glass facade, the roof terrace forms an integral part of the living room, with continuous, immersive vistas from the kitchen and lounge. We combined warm natural surfaces, contrasted by a vibrant colour palette, and included some of our client's favourite hues. 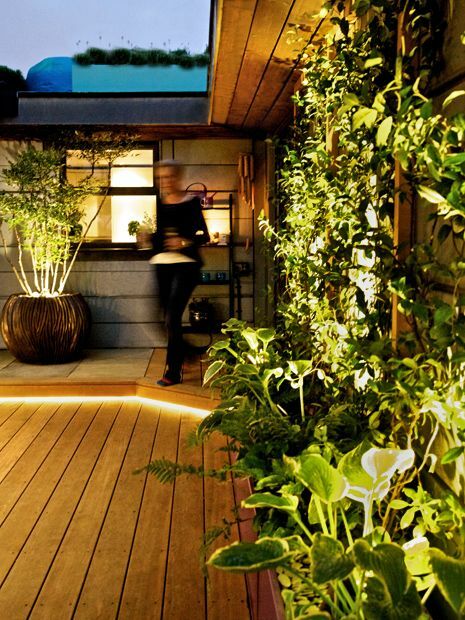 The innovative roof terrace design project melds green walls with advanced lighting techniques, alongside sculpture and a myriad of colourful, bespoke rooftop planters. 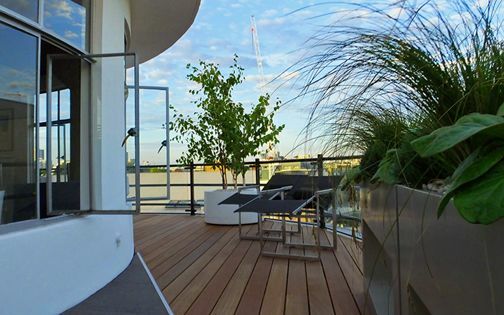 The River pots were selected for their sensuous curves resembling moving water, and while we usually design all of the planters for our rooftop garden projects, in this roof terrace, these pots complement the scheme with contrasting scale, sinuousness and warm a coppery tone. A Sacred bamboo frames the kitchen's view, while a tall Silver birch tree on the far side forms a distinct focal point for the lounge, mulched in tumbled granite cobbles. 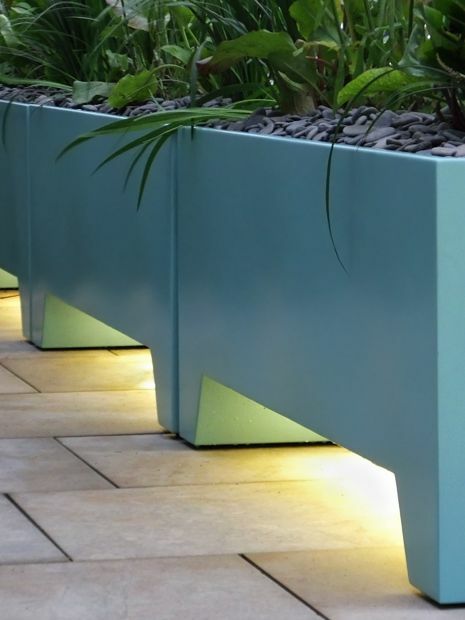 The pots' lightweight material is produced with an advanced GRP moulding technique, providing strength and colour stability in a riverfront environment. The apartment's sizeable glazed elevations form an essential element of the terrace experience; their clarity complemented by the planters' tranquil turquoise colour. Externally, the Shard view is framed with a Silver birch tree, while the river terrace setting and abundant London landmarks are enjoyed across the upper rooftop. 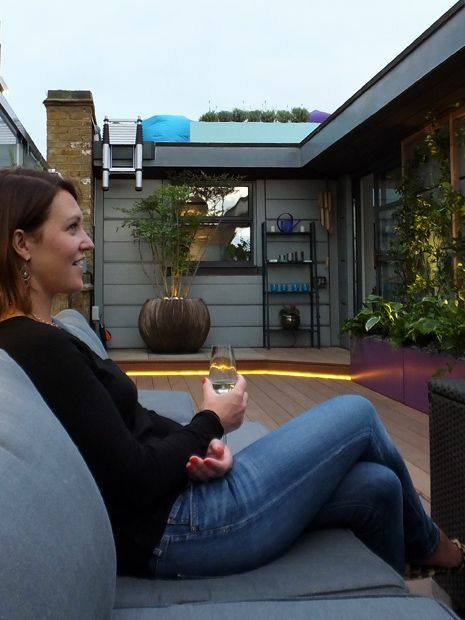 To increase outdoor use, we developed inventive design concepts to maximise available space. 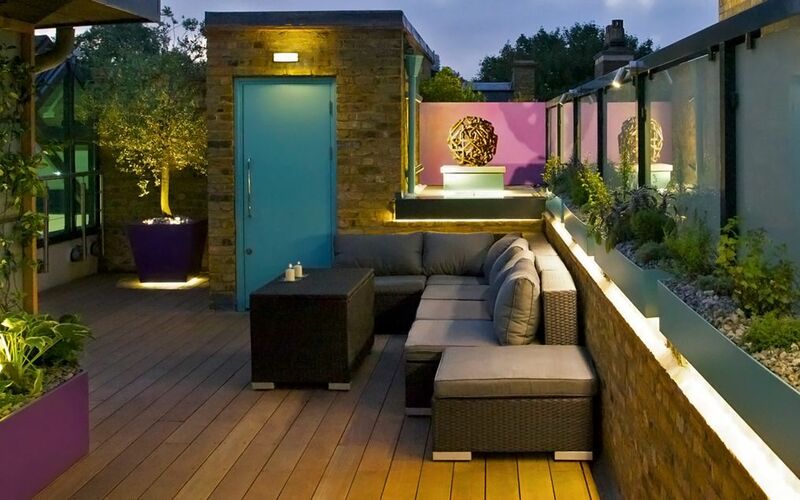 A compact telescopic ladder enables access to the smaller terrace, where a cosy rooftop is furnished with colourful pouffes, synthetic grass and an embracive, U-shaped Lavender hedge. 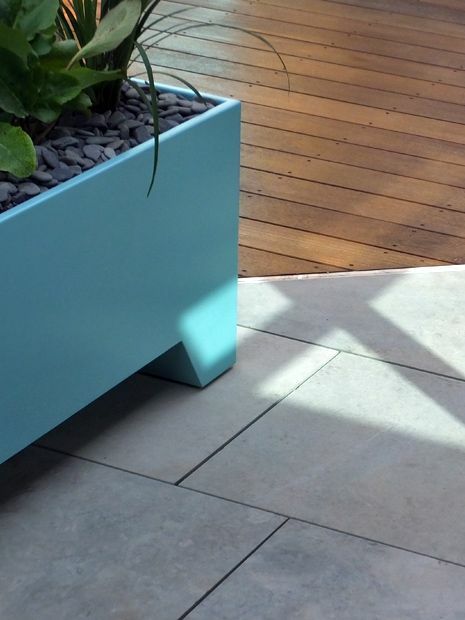 Balau hardwood decking merges diagonally with buff sandstone paving, demarcated by a luminous LED strip light. The angular landing adjoining the kitchen was raised flush to the roof terrace's doorstep, augmenting indoor-outdoor fluidity, and producing pivotal ergonomic simplicity. 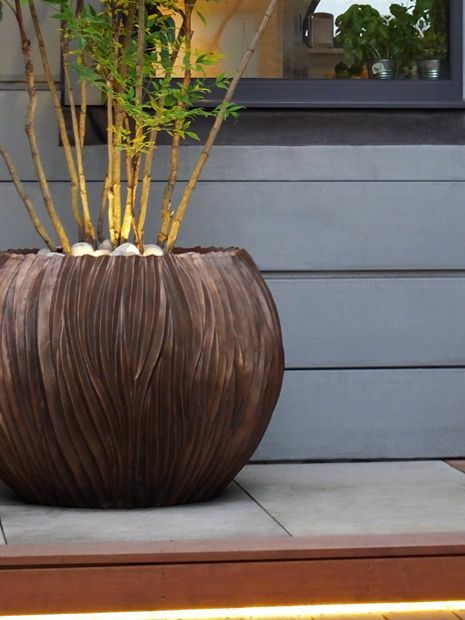 This functional detail is enhanced by sandstone pavers and a River pot featuring a graceful Sacred bamboo, where the step fascia gleams with warm lighting to define a weightless appearance. 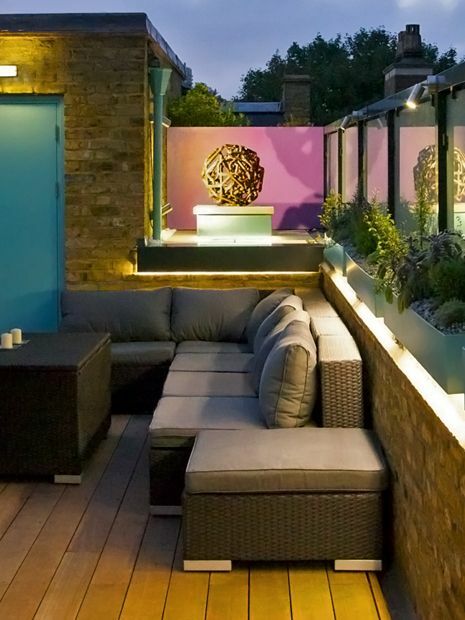 We love developing creative roof terrace designs for each unique project and client, where distinct sequences produce layout tempo with subtlety of form. The slanting uprights defining the void below the turquoise troughs follow the deck angles. The cavities are pivotal in increasing depth of space, enhanced by LED lighting. 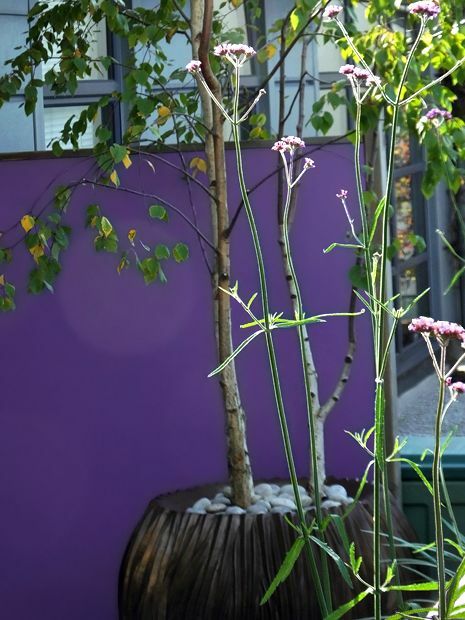 The bespoke planters' blue hues infuse clear definition above the buff sandstone, balancing tall purple Verbena heads and Daylily foliage. 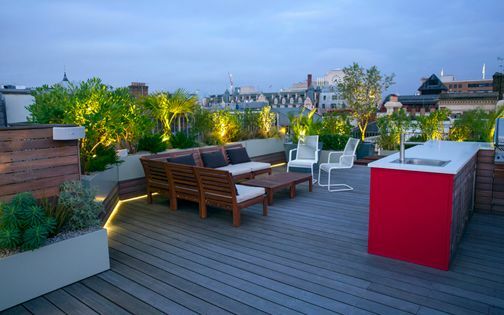 Rooftop lighting innovation forms a central motif in the project, particularly since our client enjoys the roof terrace mostly at night. Alongside shimmering Canary Wharf vistas, the terrace's illumination instils an energising ambience, where LED lighting accentuates the architectural design of surfaces and troughs, amid sculptural flora. Evening atmosphere is extended by reflections generated through the glass atrium which envelops the wharf building's entrance. We planted aromatic herbs in the turquoise slim troughs perched along the glass balustrade screen. 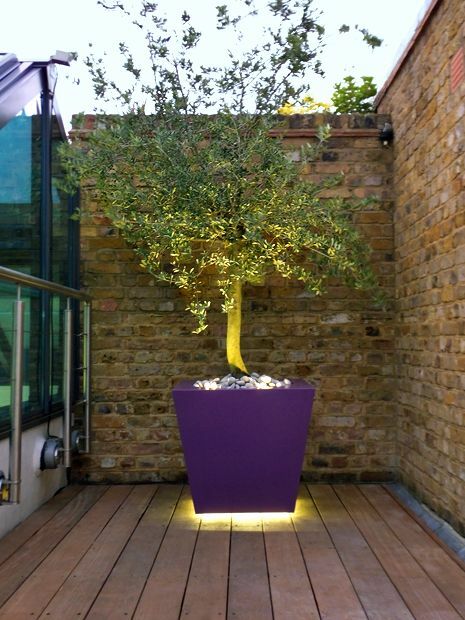 To maximise the sunny aspect, we utilised evergreen architecture, and featured a sculptural Olive tree in a purple, custom-made tapered planter. This one-off container was designed with an integral LED tape in its floating base to augment a circular top aperture, and accentuate a surrounding walled alcove, where London yellow brickwork is softly lit via the tree's silhouette. 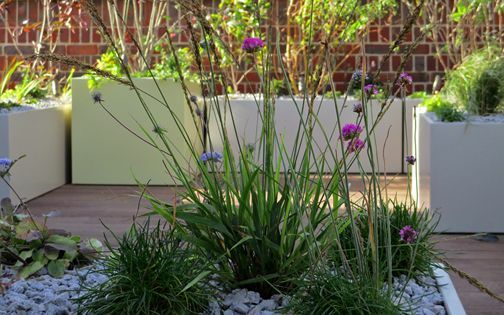 The unusual square stems of this tall perennial filter sunlight with elegance; its purple flowers key into the roof terrace's colour palette, while contrasting the turquoise and aquamarine planters. The dainty Verbenas create a see-through veil which frames the Shard's apex in the city skyline, flowering for several months, and once withered in winter, structure is provided by evergreen ground cover. 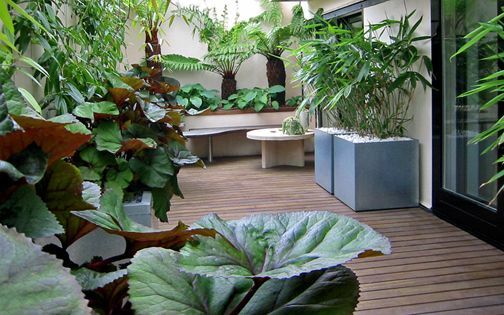 Integrating seasonal change into a roof terrace redesign is environmentally vital, where even at 40-floor height, in our Barbican roof terrace, a similar planting combo yields autumnal colour above light-blue troughs. The sculptor Julian Wild designed the custom piece exhibited in the upper alcove above the seating area. Made from copper tubing, the art ties in cohesively with the wharf's industrial nature, while its coppery tones blend into our River pots. Displayed adjacent to the purple wall, we built a small plinth to feature the modern sculpture, where the art floats atop buff sandstone, a turquoise base and LED lighting. The sculpture's transparency highlights the ambience of the terrace, projecting amplified silhouettes onto its purple backdrop. 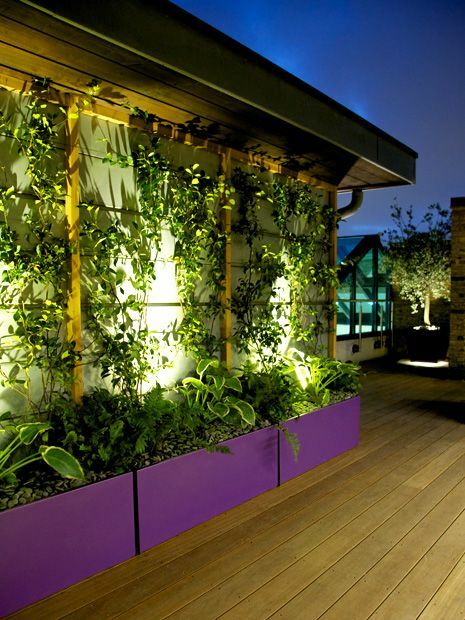 The amethyst hue defining the trio of troughs displayed along the living room highlights the green living wall of Star jasmines. The climbers are woven into a Western red cedar frame, complementing the deck and London brick walls. Lush, variegated Hostas form an underlayer, alongside native Hart's tongue and lacy Japanese tassel ferns. 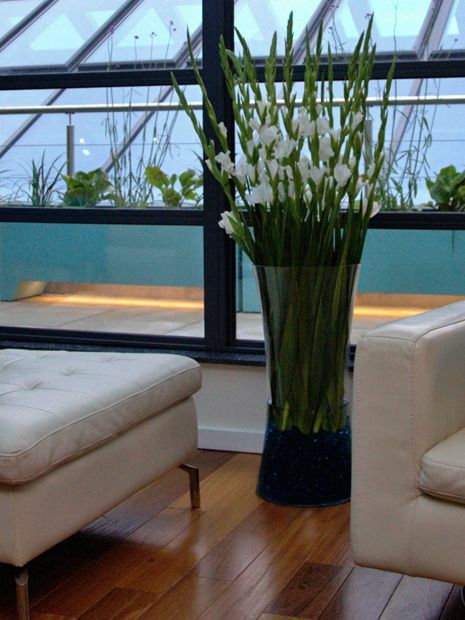 The scent of evergreen Jasmines wafts across the roof terrace throughout the entire summer, while radiant uplighting redefines this elevation fluidly at sundown, within a flourishing soft landscape. 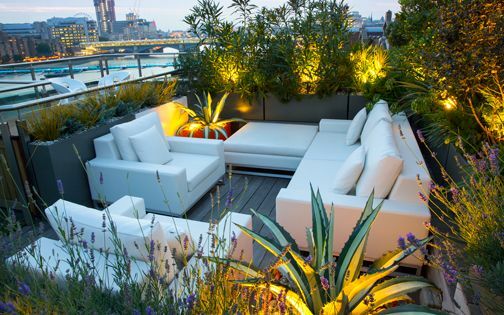 The upper rooftop floats above the Thames amid a luminescent vista of the London city skyline. 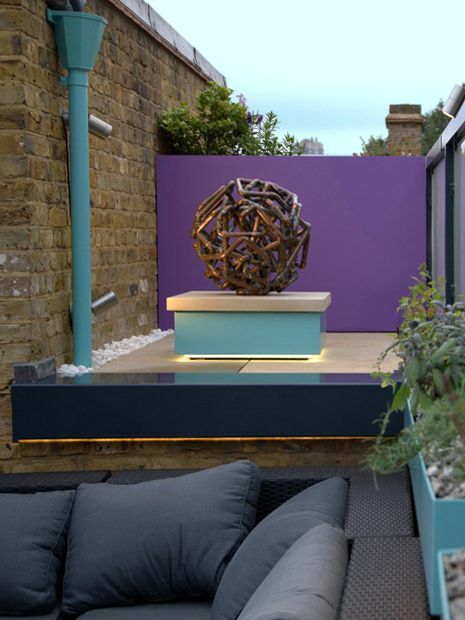 This pivotal vantage point provided scope for each sculptural element in the scheme to glisten with a warm afterglow at dusk. By utilising four low-voltage circuits, we produced an ultimate night-time experience. For our client, who spends much leisure time travelling and photographing, this panorama forms a great place to unwind and take snapshots of the urban landscape. 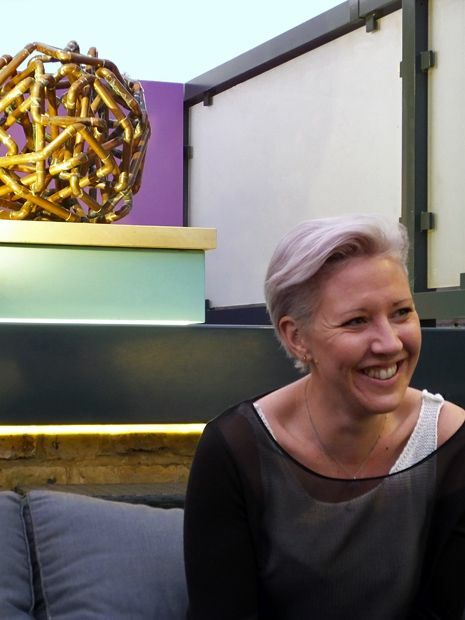 This Aberdeen Wharf roof terrace forms an intimate space, where we took inspiration from our client's travel artefacts, photographs and favourite textures, portraying their essence within an innovative roof terrace garden design abundant in bold colour. 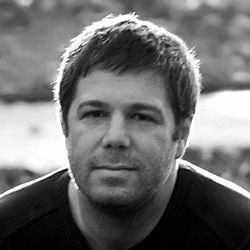 We sought to realise the full potential of an underused, neglected rooftop exterior, and immerse its outdoor space with the character of a unique client. We skilfully renovated glass panels, patiently powder coated the frames, and painted every single pipe and door in aquamarine to produce renewed verve, interlaced with a touch of urban rooftop trendiness. 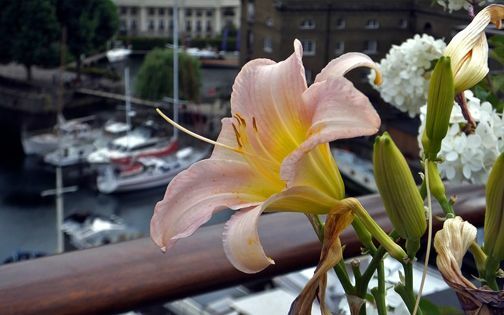 But, most of all, we crafted a thriving roof terrace sanctuary – a personal city haven floating above this quaint Wapping bay.